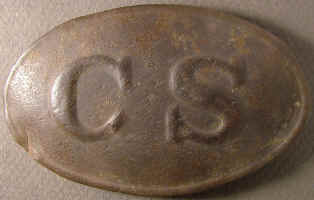 Buckle depicts "CS" and is a crude oval belt plate broadly used in the Confederacy. This style is noted for simple letters weak stamping, thin border around the edge, and oval shape that is more egg shape than oval. Plate is stamped on thick sheet brass, the die was primitive, iron wire was looped around to form hooks, back is filled with a poor quality solder. This is believed to have been issued to Mississippi troops, but it could have been used by others. Ref: Mullinax Expanded Edition, Plate 138 to 139. P0318...Confederate oval belt plate, CS, irregular "egg" shape, die stamped, solder filled, wire hooks,Confederate wartime manufacture. Buckle depicts "CS" and is a crude oval belt plate broadly used in the Confederacy. This style is noted for simple letters weak stamping, thin border around the edge, and oval shape that is more egg shape than oval. Plate is stamped on thick sheet brass, the die was primitive, iron wire was looped around to form hooks, back is filled with a poor quality solder. This is believed to have been issued to Mississippi troops, but it could have been used by others. Plate measures 54.5mm X 90mm, approx. 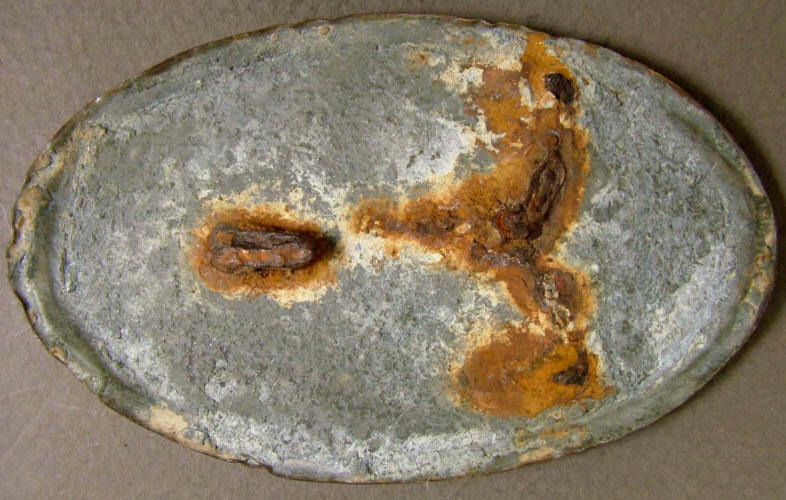 Dug plate, hooks were intact when recovered, but are weak and are mostly broken away. Recovered: Pumpkin Ridge, near Clearbrook, Virginia, by Harry Ridgeway, in the 1960's. P0546...Confederate oval belt plate, CS, irregular "egg" shape, die stamped, solder filled, wire hooks,Confederate wartime manufacture. 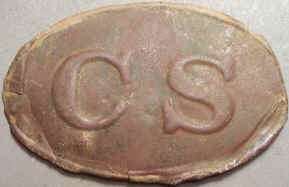 Buckle depicts "CS" and is a crude oval belt plate broadly used in the Confederacy. This style is noted for simple letters weak stamping, thin border around the edge, and oval shape that is more egg shape than oval. Plate is stamped on thick sheet brass, the die was primitive, iron wire was looped around to form hooks, back is filled with a poor quality solder. This is believed to have been issued to Mississippi troops, but it could have been used by others. Measurements not meaningful. Dug plate, missing hooks, rim damage and some lead loss. Recovered McCann Lane, Stephenson's Depot, Virginia. P0990...Confederate oval belt plate, CS, irregular "egg" shape, die stamped, solder filled, wire hooks,Confederate wartime manufacture. 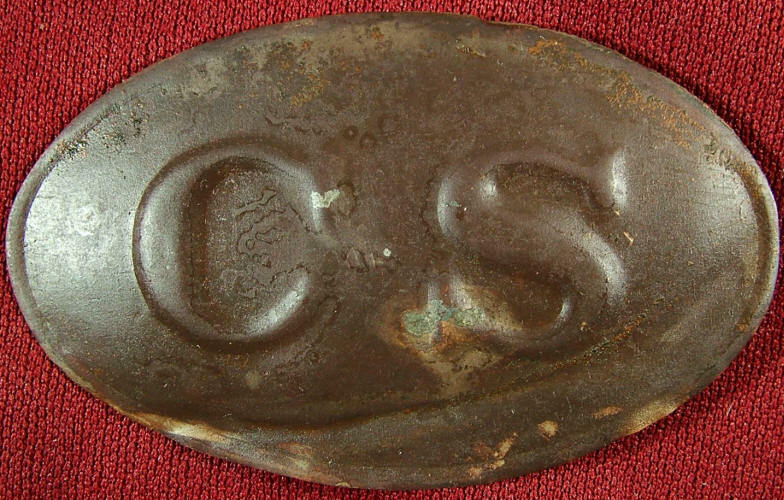 Buckle depicts "CS" and is a crude oval belt plate broadly used in the Confederacy. This style is noted for simple letters weak stamping, thin border around the edge, and oval shape that is more egg shape than oval. 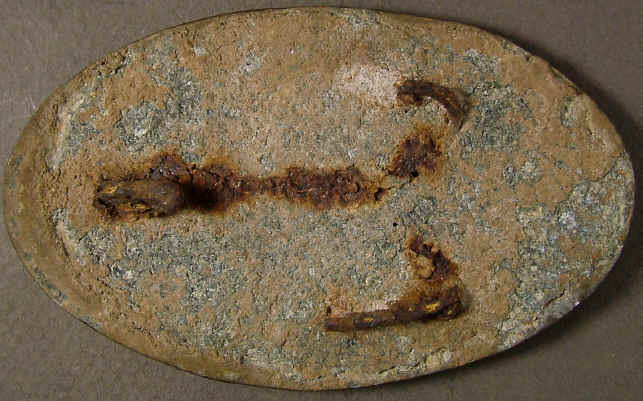 Plate is stamped on thick sheet brass, the die was primitive, iron wire was looped around to form hooks, back is filled with a poor quality solder. This is believed to have been issued to Mississippi troops, but it could have been used by others. 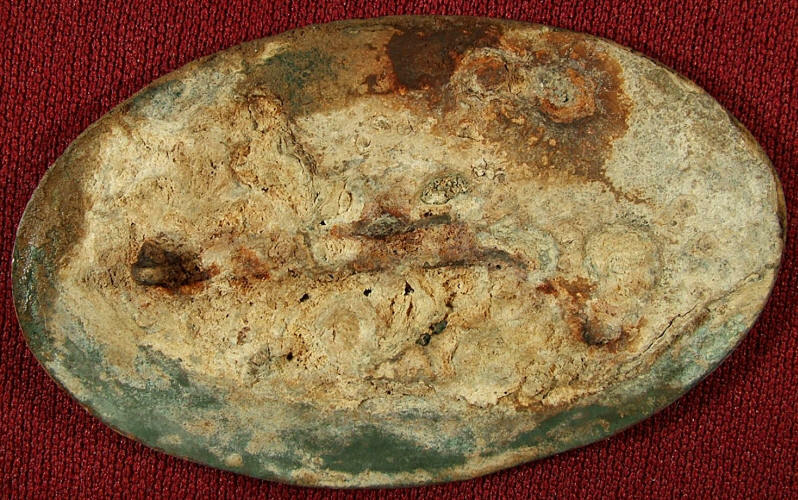 Plate measures 54.5mm X 90mm. Dug plate, missing hooks, rim damage and some lead loss. Recovered Clearbrook, Virginia. 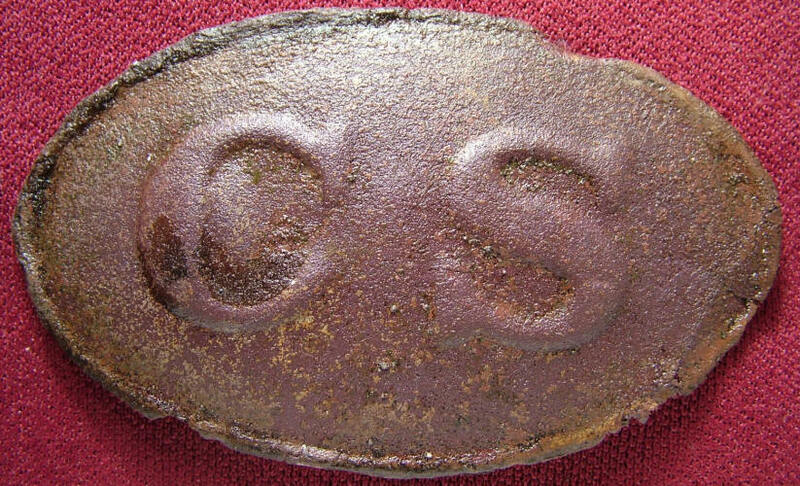 P1193...Confederate oval belt plate, CS, irregular "egg" shape, die stamped, solder filled, wire hooks,Confederate wartime manufacture. Buckle depicts "CS" and is a crude oval belt plate broadly used in the Confederacy. This style is noted for simple letters weak stamping, thin border around the edge, and oval shape that is more egg shape than oval. 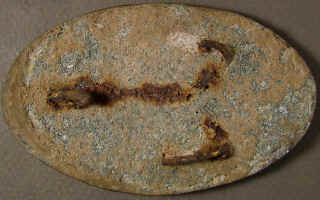 Plate is stamped on thick sheet brass, the die was primitive, iron wire was looped around to form hooks, back is filled with a poor quality solder. This is believed to have been issued to Mississippi troops, but it could have been used by others. Measurements not obtained. Dug plate, hooks missing and some lead loss. Recovered: Newport News, Virginia. P1454...Confederate oval belt plate, CS, irregular "egg" shape, die stamped, solder filled, wire hooks,Confederate wartime manufacture. 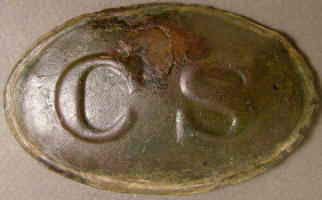 Buckle depicts "CS" and is a crude oval belt plate broadly used in the Confederacy. This style is noted for simple letters weak stamping, thin bodrer around the edge, and oval shape that is more egg shape than oval. Plate is stamped on thick sheet brass, the die was primitive, iron wire was looped around to form hooks, back is filled with a poor quality solder. This is believed to have been issued to Mississippi troops, but it could have been used by others. Measurements not obtained. 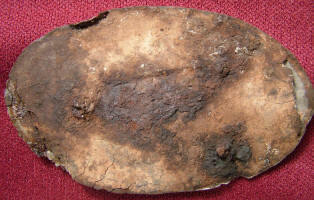 Dug plate, hooks missing, section of brass has rusted through. Recovered: Malvern Hill, Virginia. P1974...Confederate oval belt plate, CS, irregular "egg" shape, die stamped, solder filled, wire hooks, Confederate wartime manufacture. Buckle depicts "CS" and is a crude oval belt plate broadly used in the Confederacy. This style is noted for simple letters weak stamping, thin border around the edge, and oval shape that is more egg shape than oval. Plate is stamped on thick sheet brass, the die was primitive, iron wire was looped around to form hooks, back is filled with a poor quality solder. This is believed to have been issued to Mississippi troops, but it could have been used by others. 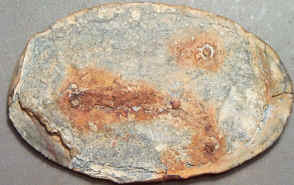 Dug plate, hooks missing, upper right corner was bent and has been straightened, bend is not broken and is not glued, iron hooks missing as usual. Recovered: Virginia campaign.